Flames and smoke were seen billowing from the roof at Notre Dame Cathedral in Paris on Monday. 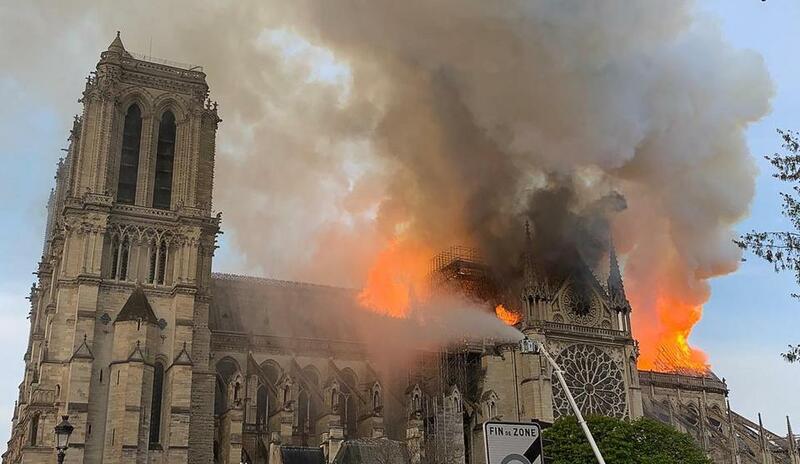 ■The fire burst through the roof of the centuries-old cathedral and consumed its towering spire, which collapsed, followed by the entire roof, Reuters reported. ■The fire’s cause is unknown, reported Agence France-Presse. ■The blaze, which spread extremely quickly, took hold in the loft of the building, firefighters told AFP. The fire alarm was sounded at about 6:30 p.m. local time, a cathedral spokesman told told The New York Times. ■AFP reported that a part of the Ile de La Cite neighborhood where the cathedral is situated, at the heart of Paris, was being evacuated at around 7:30 p.m. local time. A massive blaze Monday toppled the spire of Notre Dame Cathedral in Paris and badly damaged its roof, while France and the world watched in horror. ■The Associated Press reported around 9 p.m. that the mammoth blaze had spread from the spire to one of the church’s rectangular towers. Paris police said firefighters were working both inside and outside the building, while red smoke poured out of the cathedral. The church’s entire wooden interior was in flames, a cathedral spokesman said. 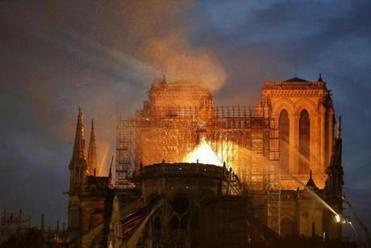 Notre Dame de Paris en proie aux flammes. �motion de toute une nation. Pens�e pour tous les catholiques et pour tous les Fran�ais. Comme tous nos compatriotes, je suis triste ce soir de voir br�ler cette part de nous. ■Authorities are investigating if renovation work on the cathedral’s fire was a factor in starting or spreading the fire, AP reported. ■There was no immediate word on any injuries. ■ Notre Dame is the most famous of the Gothic cathedrals of the Middle Ages. The foundation stone was laid by Pope Alexander III in 1163. It was built on the ruins of two earlier churches and before that, the site was used for a Gallo-Roman temple dedicated to Jupiter, acccording to britannica.com.